Washington DC is a treasure of sights, monuments and museums, including the Smithsonian Institution and the various U.S. Houses of Government. It's also a fun & very interesting destination for romantic weekends, anniversary trips, and honeymoons. Best Time to Visit Washington DC - a winter getaway will probably restrict you to all the museums and indoor historic sites in the area. Autumn is a pretty time in D.C and Virginia, and May and June are comfortable months before the heat and humidity of summer set in. During the National Cherry Blossom Festival (first 2 weeks of April), Washington DC is at it's prettiest! So no matter if your romantic getaway in Washington D.C. is winter or summer, we've included a mixture of indoor and outdoor things to do in the Washington DC metro area. Have fun exploring D.C.! 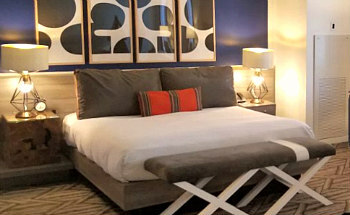 Romantic Getaways in Washington DC - Weekend Hotel Packages - discount Web Rates at the Mariott, Sofitel, Fairmont Washington DC & more. Luray Virginia Romantic Cabins & Cottages - these honeymoon cabin rentals are just 90 minutes drive from the capitol, and they offer hot tub suites, fireplaces and private decks. There's activities like kayaking, hiking and fishing in nearby Shenandoah National Park. Potomac River Dinner & Dance Cruise - Odyssey Cruises for 2017 offers romantic dinner cruises with dancing on the Potomac, complete with DJ's, large outdoor patio decks, and buffet dinner. Washington DC Memorials at Night - avoid the daytime crowds and enjoy historic D.C. at sunset and during the evening. The popular Lincoln Memorial, as well as both the Jefferson and Roosevelt Memorials take on a unique and romantic beauty at night under the lights. 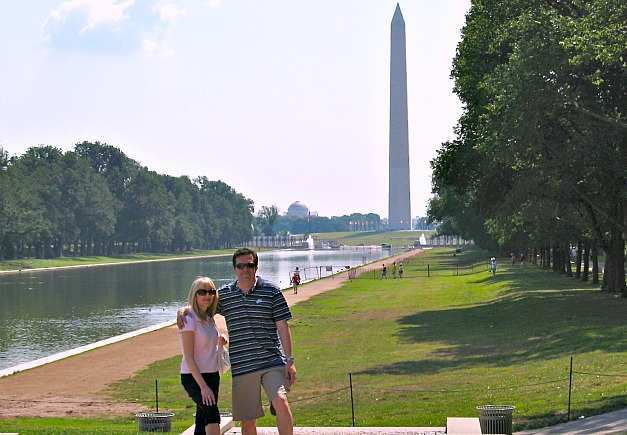 Washington Monument - a natural choice for the breathtaking views of Capitol Hill. Top Floor, Newseum - one of the newest and best museums in Washington, DC (very interesting) also has a great open terrace with a scenic view of Capitol Hill and Pennsylvania Ave.
Sky Terrace, Hotel Washington - discuss the federal budget and the best views of Washington D.C. over a couple of cocktails on the roof of this romantic hotel. The Mall - you've seen it in movies, now take a romantic walk down this scenic and historic corridor. In Front of the Lincoln Memorial, with the Washington Monument in the Distance. Georgetown - tour historic sites, discover the waterfront shops, or dine on crab cakes in one of this areas romantic restaurants. Theodore Roosevelt Island - after a day or two of seeing Washington's great museums and historic sites, hit the great outdoors in Roosevelt Island, one of the best secluded spots in Washington DC. You can walk, bike or even kayak here, and enjoy the peaceful views of the city across the water. Eastern Market - a fun romantic activity on Sundays is strolling through the streets of this Capitol Hill neighborhood and exploring the farmers market, arts and crafts and food stands. 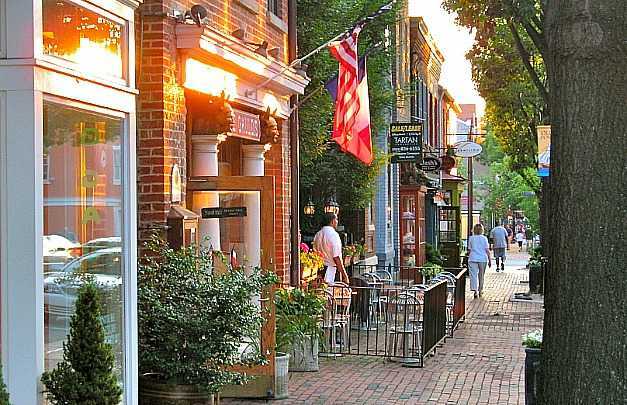 Lots of Shops and Cafes to Explore Along Attractive King St in Alexandria, VA.
Old Town, Alexandria, VA - just across the Potomac River in Virginia, you'll love this historic waterfront town & seaport with it's antique shops and quaint restaurants. Enjoy a romantic horse-drawn carriage ride down the cobblestone streets. For a romantic weekend stay, you'll love the Morrison House Boutique Hotel. 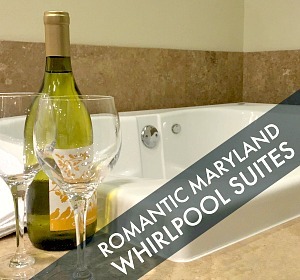 Virginia's Romantic Hot Tub Suites - bubbly getaways in hotel and B&B Whirlpool suites. Great Falls Park - with it's superb setting on the banks of the Potomac River, scenic Great Falls Park is a nice spot for a romantic picnic on a day trip from Washington, DC. (14 miles from the city). Romantic day trips and weekends away from Washington DC - see our tips and reviews on romantic Virginia Getaways for Couples. 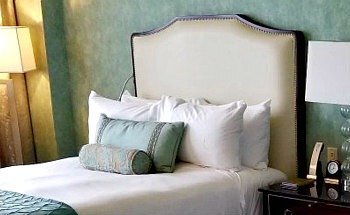 Also right next door to DC are lots of options for escapes and romantic weekends in Maryland. The Official Washington DC site for tourism is Washington.org and they feature lots of info on events, festivals, eating and getting around D.C.